English language learners (ELLs) are often misdiagnosed as having a learning disability or speech and language impairment and as a result are placed into special education programs. Response to Intervention (RTI) is a framework that can reduce this misdiagnosis and help these learners achieve more over time. This chapter explains how some of this misdiagnosis occurs and how to use Response to Intervention with the ELL population to overcome this problem. It includes research-based interventions proven to work for this population, suggestions on how to implement an RTI model, and case studies of students who represent situations that often come up in the field. With successful implementation of an RTI program, it is hoped that all students will receive the targeted support that they need and deserve. 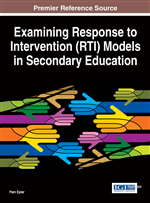 Response to Intervention (RTI) is a relatively new intervention model on the secondary level that can be used in the general education classroom to assist struggling students and to identify and solve problems related to specific student issues. It is typically built on a three-tier framework in which instructional interventions are initially made in the general education classroom; students then move up or down the tiers based on the intensity of the intervention needed (Fuchs & Fuchs, 2007). The RTI model improves learning for all students and is especially beneficial for those who are struggling, such as students for whom English is a second language since they often strain to catch up with their English-proficient counterparts. However, little research has been done on the specifics of how the model can be used to address a significant English language learner (ELL) population, one that is often overrepresented in special education and often labeled or identified as struggling in middle and high school. At all tiers of the RTI model, students’ progress is monitored in order to assess student responsiveness to an intervention. Schools must use their research to determine what adequate progress is and when students should move to more intensive interventions, or tiers, of RTI. Schools must also employ a universal screening, which is the skill-specific testing of an entire school or group of students, two to three times a year. With universal screening, educators can compare English language learners with other struggling students who are receiving the same instruction and intervention in order to determine if a specific student is genuinely struggling or not progressing. The RTI model can also be used as a diagnostic tool for students with specific learning disabilities as another approach to the traditional discrepancy model, where students are diagnosed based on a discrepancy between academic achievement and cognitive scores. RTI provides educators with information about how struggling students respond to particular interventions and the type of instruction they might need to succeed in a particular skill or academic area. Using RTI to assist in the diagnosis of specific learning disabilities has the potential to prevent many misdiagnoses in the field of special education. The model strives to keep students in the general education classroom by identifying appropriate instruction and tools that students need in order to succeed. According to Hagan (2010), the Response to Intervention service delivery model can reduce the number of ELL referrals for special education services if the following occur. First, there must be a universal screener conducted in the student’s native language and in English. By conducting an assessment in both languages, the reviewer will see if the student is not understanding the concept (as evident by the student’s native tongue test) or if the student does not understand the idea due to the language barrier (as evident by the test given in English). Once these data are collected, then appropriate research-based instructional strategies can be determined. Next, regularly scheduled progress monitoring must happen in order to ensure that the ELL student is making adequate academic success. If progress is not being made, then the teacher’s lesson delivery must change. The ELL student’s progress should not be penalized based on his or her accent or dialect, and these slight deviations need to be taken into consideration when the teacher is monitoring the student’s progress (Hagan, 2010). Hence, to avoid disproportionality of ELL students in the special education programs, all teachers must be educated in the linguistics and culture of the students they serve. Only by doing the aforementioned will the numbers of ELL students in the programs for students with exceptionalities be reduced and possibly eliminated.